Paging systems deliver efficient care and staff coordination in a healthcare environment. In these environments, a cost effective way of staying in touch with critical medical, maintenance and nursing staff is essential. That is why Aid Call have designed intelligent pagers with a range of features that allow the safe provision of care at the highest standard. Aid Call pagers work seamlessly with our Touchsafe Pro wireless Nurse Call system, they can be integrated with your existing system, or they can be used as a stand-alone system. So whether you need 2 pagers or 12, our products provide the ultimate flexibility for healthcare facilities. A range of flexible solutions designed to deliver efficient care and staff coordination. Robust and waterproof, perfect for the care environment. Aid Call’s Bluebell Intelligent Pager combines the functionality of a pager and a nurse present ‘Buddy’ in a robust, waterproof portable unit. Paging messages sent from the main nurse call system are displayed on the clear, backlit display and stored in memory for later review if necessary. 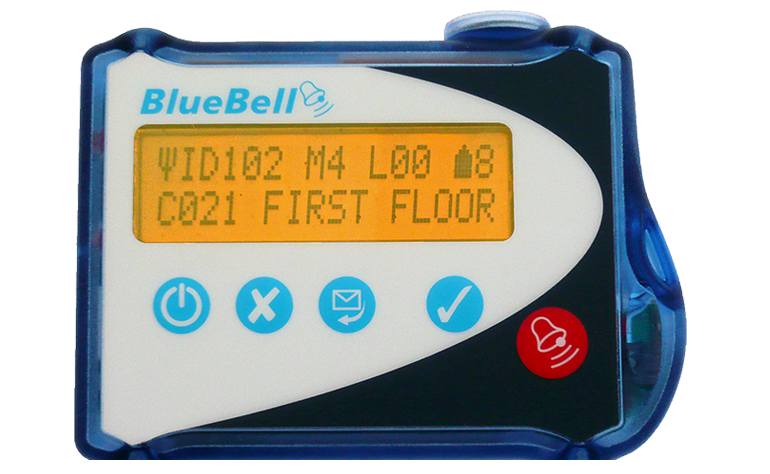 As well as normal pager functions, Bluebell can be used to trigger a call point to give a nurse present indication on the display panel. The system can be programmed so that all calls are reported to all pagers, or day/night groups can be set so different pagers are notified depending on the time of day. Furthermore, they can be configured into zones so calls are only notified to staff responsible for specific areas. Using the Logon Terminal, any pager can be allocated to a staff member using their unique Carer ID. In addition, the display panel shows the Carer ID, giving management real-time information on staff location and activity. System activity and Carer ID are also shown on the call logger, allowing management to run reports on individual staff and overall performance. Accidental removal of the Bluebell portable can be prevented by using an Exit Beacon or by programming an out-of-range alert. When the Bluebell unit passes the Exit Beacon or goes out of range it alerts the user. If the pager leaves site then it will start to bleep and can only be stopped by returning it to the charging rack. Fully IP rated waterproof to 1m depth so can be wiped or fully washed down in support of infection prevention strategy. Carers eliminate wasted time walking to check nurse call panels and increasing availability for attending to resident needs. 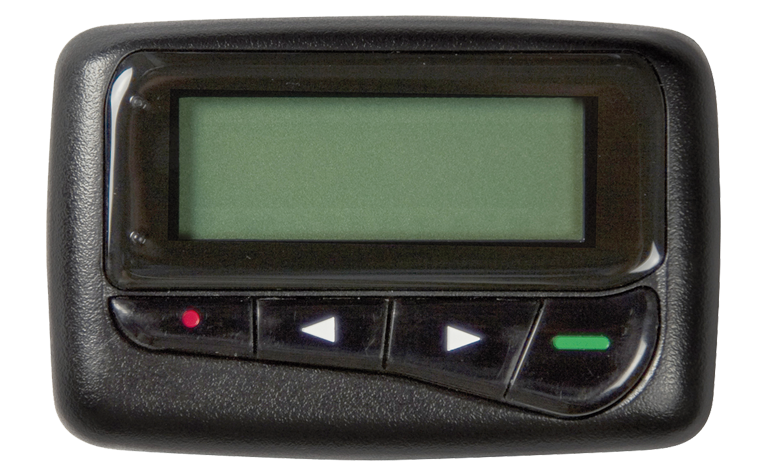 The J25 alphanumeric pager boasts a large screen with a 2 line, 36 character alphanumeric display. Its battery life is up to 700 hours and it weighs just 50g, making it easy to use and carry. For silent operation you are able to adapt the pager to a vibrate only function, they can be setup so that different pagers are notified at different times of day, and they can be configured into zones so they only notify staff responsible for specific areas. 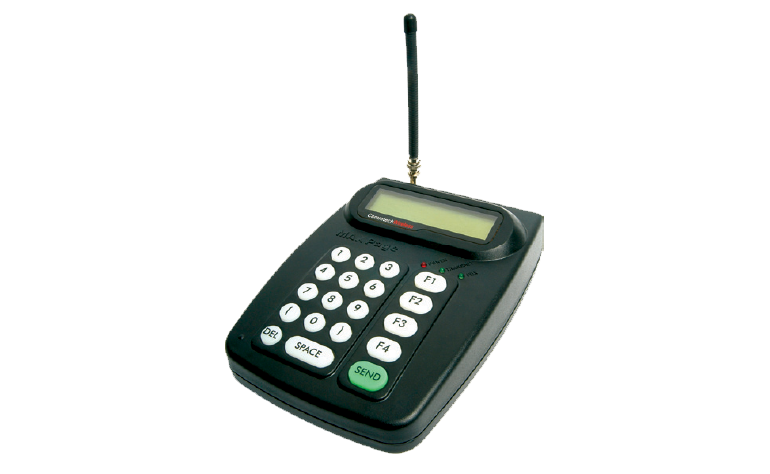 The Maxpage terminal can send independent messages direct to individual pagers. It can be linked to up to 999 pagers and, combined with the J25 pager, can form the basis of a stand alone paging system as well as being part of your nurse call system.